Maybe you’ve been working as a practitioner inside an organization and you’ve been dreaming about the day you might hang out your shingle and become a consultant or speaker. Or maybe you’ve been working in one lane (as an HR consultant, for example) and are itching to change lanes and try something new (say, as a book coach). How do you navigate from point A to point B? Actually, both of these scenarios has been my experience. Many years ago I was working at my corporate HR job, and was considering a move to become my own boss as a HR consultant, speaker, and trainer, and I made the leap. 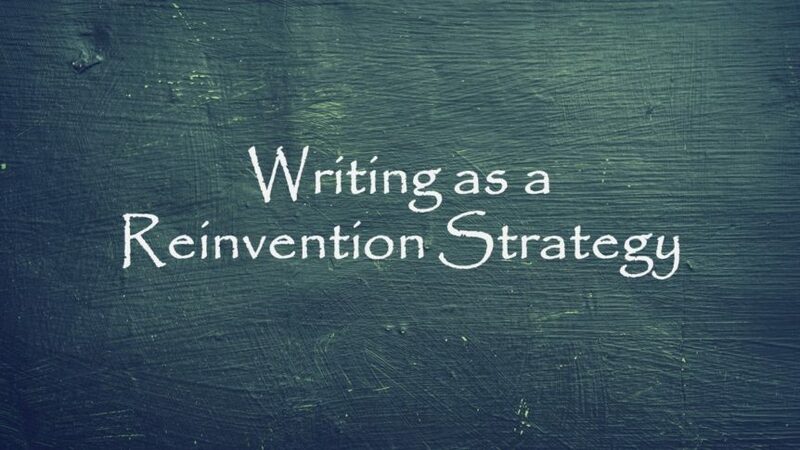 And more recently, I was working as a HR consultant and considering what I might do to get out of my rut and try something new, when I was presented with an opportunity to codify my writing process and try my hand at book coaching. In both instances I was able to make the leap successfully and fairly quickly. And as I think back about how I made that happen, I realize that I used one very powerful tool to help get me there. What did I do? I wrote! The first few months of my career as a speaker and consultant I did two simple things that created a steady stream of business for more than 20 years. Number one, I wrote a media release, and two, I wrote an article. When leaving my corporate role in Human Resources, I wrote a media release that I sent to Human Resource Executive magazine indicating that I would focus my business on strategies for recruiting entry-level employees. They picked up the release and published a tiny clip of my announcement. The following month the publication wrote an article on recruitment, and the reporter called me for my insights. I was the only consultant quoted in the article. The subsequent article resulted in two calls to book my speaking and training services, which led to a number of other leads and opportunities. During those first months I also called on the Kentucky Restaurant Association since my most recent experience in HR was with Kentucky Fried Chicken. I thought I would be a logical choice as a speaker for upcoming conferences and programs. While waiting for my meeting with the Executive Director, I noticed that they published their own industry monthly magazine, and when I met with the director I asked her if the organization was looking for contributing authors, and she indicated that they were always looking for great content from experts (Note: I later learned that nearly all publications accept targeted content from thought-leaders). I wrote an article, which ran in their next publication. After many years (and having written five books) as a HR consultant, speaker, and trainer, I wanted to change lanes. It’s a rather complex story, but the bottom line was that I wanted to use my talents and abilities in a new arena but had no idea about what to do or how to get there. One day I received a call from my chapter president of the National Speakers Association, and he said that he’d heard that I had written a book in less than six weeks. “Well, actually, I wrote four of my five books (at the time) in less than six weeks,” I replied. “Hmm . . . no one has ever asked that question. Well, I guess I do have a process!” I answered. As I worked with Joan and Vivian, they suggested that I should consider book coaching. While I had never even thought about it (in fact, I didn’t really know if there was such a thing), I considered it. And when I presented my program, my fellow chapter members enthusiastically suggested that I look in this direction. But how does one become a “book coach”? Again, I thought back to my early days as a consultant and speaker. I wrote. So, pretty quickly I realized that if I was going to establish myself as a book coach, I needed to have THE credential that would prove my competence—a book! And, if I was going to establish my brand on how to write in six weeks, I’d better write this book in six weeks. What has been so amazing about this journey is that I have again proven what writing can do to position or reposition your career. In 2018 I celebrated having helped over 130 professionals become published authors. Books, articles, and blogs can be positioning and re-positioning tools to establish your thought-leadership, credibility, and visibility in your new field. There is a reason that we have all heard the expression, “She wrote the book on it.” Writing, and especially writing a book, is the ultimate method for claiming your expertise. When you write a book, a blog, or an article, you are documenting your position on the issue. You are planting a stake in the ground and claiming this intellectual property as your own; you are establishing your thought-leadership. In a book or article, you can show prospects and clients how you work, why you do what you do, and can paint a picture or create a vision about how you will connect with them. You connect your brand with your topic or thesis, and you allow the client or prospect to understand your perspective. You educate your clients and prospects about aspects of your topic that you can present in a unique way or through a unique perspective. In writing, you clarify your own knowledge about the topic, and are able to articulate your values and philosophies regarding this issue. By socializing your ideas, you make others aware of how they might work with you in their businesses. Writing becomes a multiple-purposed activity, in that it can serve as a pipeline to identify and entice prospects, it can serve as part of your sales funnel, and it can be an actual revenue stream. Writing, especially books, can help you close more sales by increasing your credibility, expand your reach beyond those you know in your current circles, can help you earn more money through book and related sales, and can help you in raising your fees because of your added visibility and credibility. The great thing about writing is that it is in a form that can be easily shared with clients and prospects. Having written a document is literally the documentation of your expertise. Give books to clients and prospects as a “calling card.” My friend Jeff is finding that he is booking speaking, coaching, and consultant assignments by giving away copies of his book. Send links for online articles and posts to prospects, or promote them on social media. You don’t need to have a blog on your website to post articles on LinkedIn and other social media channels. Put “author of . . .” on your email signature to generate more visibility. One of my anthology authors added this to his email signature as he was working on his chapter, and pre-sold books to one interested contact. Look for opportunities to appear on television talk shows, podcasts, and radio programs. You’ll not only promote your new book or white paper, you’ll also generate possible leads (or at least keep you top of mind with your target audience). Explore magazines and newsletters who would like content around your topic, and submit your articles for publication. You’ll reach new audiences and generate more business (as I did when I wrote the article for the Kentucky Restaurant Association). If you’re considering changing career lanes or a major reinvention of your business, writing can be a powerful tool to move quickly and stake a claim in new turf.